Get on the road to improved non-ferrous recovery! 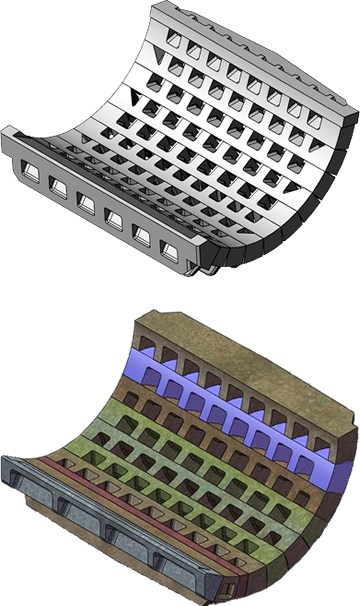 We developed RecoveryGrates for operators who’ve realized they’re shredding materials other than just ferrous. Designed to increase non-ferrous metal separation in the shredding box, our exclusive K2 RecoveryGrates allow greater yields from your downstream. Customized hole positioning, sizing and discharge angles can work with just about any shredder or rotor style on the market. Use K2 RecoveryGrates alone or with your existing grates to improve the shredding process with minimal effect on production rates and power consumption. Wear indicators let you know when it’s time to change grates – reducing shredder box inefficiencies caused by worn grates. When feedstock is at a premium, you need to focus on maximum recovery – as recovery is a direct boost to your bottom line. Don’t let your grates go along for the ride. Put them to work for you!